Growers strive to grow in their flower beds or balcony petunias, which until late autumn you can enjoy lush flowering. There are many hybrids of Petunia: cascade and erect, small shrub with double and simple flowers, with cascading shoots or wavy ruffle. But they all require proper care. Petunia propagated by seeds, which should be planted in early March (or late February). If you are growing seedlings at home, then it is better to take the seeds with a large margin, as the lack of light when the sprouts can germinate only parts. The soil should be light, nutritious and loose. The day before planting, carefully pour the soil with water, mix sand with the seeds and evenly sprinkle on the surface of the earth. Sprinkle the top with water and cover the pot with plastic or glass. The optimum temperature for growing seedlings is 20-24C. Approximately the fifth to seventh day will be a small fruit. At the end of April – beginning of may grown seedlings can be transferred to the greenhouse, while warm weather in the open ground. Petunia is drought resistant, but during a long absence of moisture requires irrigation. Note that large-flowered varieties of Petunia are more demanding to moisture, warmth and nutrition conditions than melkotsvetkovye. The main condition for a long and profuse flowering of Petunia – feeding. So to make fertilizer is recommended every 7-10 days, starting one week after planting. Abundant blooms provide a comprehensive fertilizer, which is dominated by potassium. Give a good result of fertilizing with organic fertilizers (humic fertilizer and mullein infusion). Planted seedlings of flowers in containers and pots is pretty tight (about 70 plants per square meter). Trailing and creeping varieties of petunias are cultivated in hanging baskets, tall pots and balcony boxes. 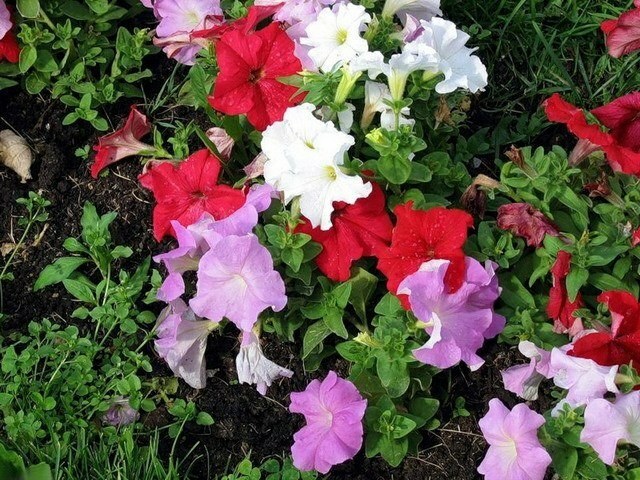 To achieve an abundant flowering and lush growth, often watering petunias and spray them with water from a spray bottle two or three times a day. Rains can cause serious damage to ornamental species Petunia. Drops of water can literally tear the delicate petals. Therefore, before the rain to clean vases and baskets with petunias under the shelter. Watering flowering plants gently at the root, be careful not to damage the flowers.